The first task across his plate was to understand our current MIDI scripting capabilities. MIDI Scripting is when Liquid Rhythm not only responds to actions on a MIDI device, it also has code to update the state of the device. Thus aspects of the user interface state are clearly visible in the device, and the hope is to allow seem less music composition without the need of a keyboard and mouse. We are currently actively scripting the following devices: Novation’s LaunchPad S, Keith McMillen’s QuNeo and Livid Instrument’s Base. 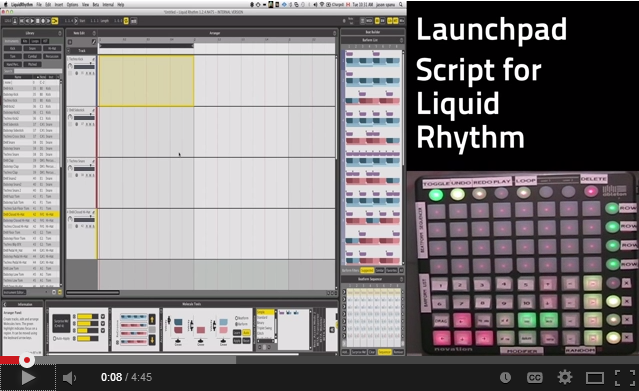 All really amazingly fun devices to play with in Liquid Rhythm. The first one Jason grabbed was the LaunchPad S, and went through to master it (and of course a whole bunch of new feature requests queue up for MIDI Script version 2 — how does he do it?). He couldn’t remember what all the buttons do, so Jason grabbed accounting’s label maker, and desecrated the our rented Launchpad S. Now all the little buttons have littler feature names (why didn’t we think of that?). In his first deep dive, of what I suspect will be many deep dives, he got his multi-cam setup, and quickly put together this LaunchPad S demonstration video. This goes through the default mapping of Launchpad S when you connect it directly to Liquid Rhythm Standalone mode, as of version 1.2.4. Keep in mind, this feature is currently marked beta, but it is available to our entire user base. We are absolutely looking for feedback and improvement ideas for future scripts we will be creating. This scripting support is currently limited to Standalone mode. We are working to extend our ability to support MIDI Scripting to work in the Ableton Live 9 Max for Live mode, as well, if possible, in the plugins (VST/AU/RTAS). Keep an eye for updates along these line. That’s interesting news ! An ABLETON certified trainer will probably help to get fluently working of LR into LIVE ! I think the best way to implement Midi controllers would be to make a customizable midi editor where the user can assign buttons knobs and faders to as much parameters in liquid rhythm as possible. The same thing should work with midi-out so that you can send midi messages to your midi controller. With a little background on the behavior of the launchpad for example you could create your personal midi scrips and tell the launchpad which button should light up in which color when something in the program changes. With The optional option to Combine different midi controllers and the computer keyboard in this editor would make a powerful control interface. I always missed such a midi editor in ableton and it would be great if you made one for liquid rhythm. We have been considering that, we have been in talk with SmithsonMartin.com, they have this cool MIDI Emulator, and we were thinking of creating a MIDI template that looks like a LaunchPad. Then you program your controls into their template (WYSIWYG) , and its a visual MIDI editor, then we would need respond back with a “mirror” of the MIDI. A little more thought is needed, because the power of the launchpad and many similar devices is that they can be color coded. The color coding usually occurs through sending a velocity. Different velocities mean different colors. So the challenge is to give that control into the editor, so as you MIDI Scripter, you would be able say State A means Color X (which is Velocity Y)..